Two hours south of Sydney on the NSW South coast are two of the most striking seascape locations in the country. 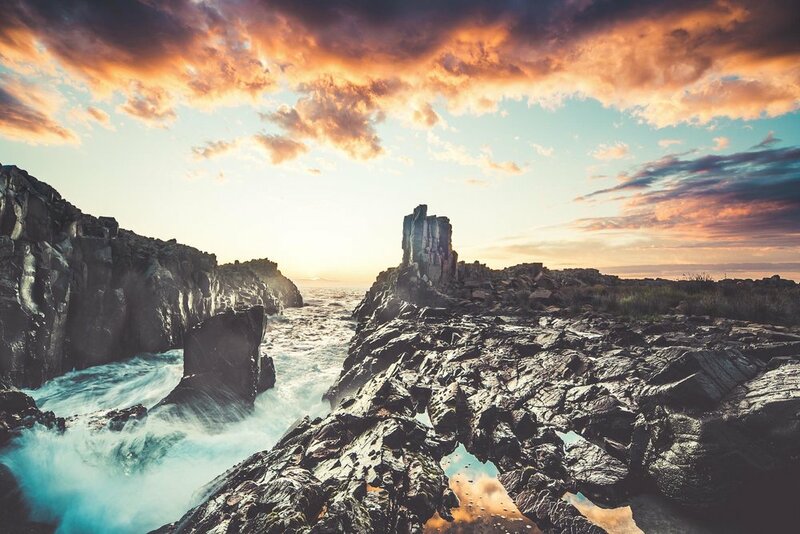 Alfonso Calero shares six handy tips for anyone hoping to capture remarkable images of Bombo Quarry and Cathedral Rocks. 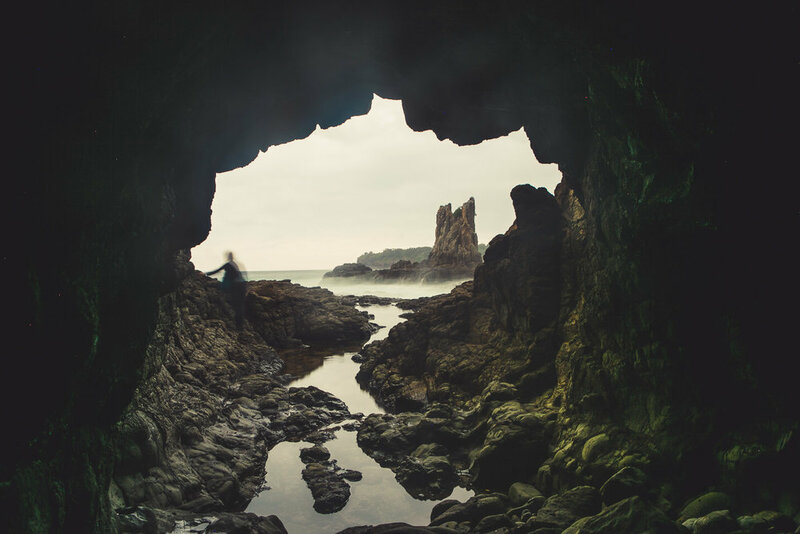 Bombo is a two-hour drive south of Sydney. The best way to access Bombo Quarry is from Darian Avenue. From your car it's a 15-minute walk to various part of the quarry with numerous vantage points depending on the time of day and the tide. If you want to shoot Cathedral Rocks park at Jones Beach car park and walk about 15 minutes along the beach heading south. A moderate level of fitness and flexibility is required to tackle these two locations. Getting up at dawn isn't easy, but it's worth the bleary eyes. Use an app to check the sunrise time and try to get set up 30 or 40 minutes beforehand. Check the tides too and be extra careful when it comes to setting up your tripod and camera. Don't put yourself, or your gear, in harm's way. Once the sun is up it will be too difficult to shoot, even with a proper hard grad filter. If you are thinking of shooting at night, Bombo Quarry rather than Cathedral Rocks is safer and easier. A wide-angle lens somewhere between 16 and 24mm (equivalent) is ideal for seascapes. You'll need a sturdy tripod to keep your camera from moving in the sometimes gusty winds and a plastic cover to keep any rain or water spray out. A cable or remote release is handy to stop you bumping the camera when you push the camera, but using the self-timer is a cheap alternative. There are all sorts of filters that can help you get better pictures but the best is the neutral density (ND) filter which helps you cut the light and use a slower shutter speed. Graduated ND filters which are darker at the top and clear on the bottom are great for managing high-contrast sunrise photos. To get the best quality out of your camera select the lowest sensitivity setting, usually 50 or 100 ISO. For optimal sharpness and depth of field, I use an aperture of f/11. Every lens has an optimal f-stop, at which it is sharpest, usually between f/8 and f/16, so experiment to see what works best. Shooting RAW delivers better quality and more editing options than JPEG.In regard to shutter speed, most of the images in this story were photographed between 1/15s and 30s, depending on what I was trying to achieve. It can be challenging at this location to get plenty of detail in the dark basalt rocks without blowing out the highlights in the sky. See if you can choose one element that will be the dominant part of your shot. Look around the frame for distractions and look for ways to eliminate them. Remember, photography is the art of subtraction. Leading lines can be an effective tool to lead viewers' eyes to the main subject. Be aware that brighter areas will attract the most attention so make sure they aren't distracting from the overall composition. Make sure the horizon line is level. I use three different types of software for editing – Lightroom, Photoshop and Nik Software – and I use them in that order. I do most of my editing in Lightroom, advanced re-touching in photoshop and, finally, I use Nik software to add just a little more Pop. Aside from the basic edits of white balance, tint, contrast, highlight and shadow, my favourite tools to use are the graduated filter and the adjustment brush.